Hey, how are you? I CAST YOU OUT! Sorry, got excited. Getting ahead of myself again. First things first, I’m Father O’Bannon and I’m assuming you’re not the one whose all blaaahhh, right? That would be your… mother… daughter? I was going to say daughter. Because she does not look good at all. Okay, what do you say we get started. Do you have a pair of glasses? I forgot mine. Something in the general I-need-to-be-able-to-read variety? Not really my style, but thank you. Alrighty, here we go. Let’s see what the good book says: “Realizar un exorcismo cristiano: Muchos individuos y familias se ven afectados por posesiones demoníacas de una persona”… Oh, crap, it’s in Spanish. Hold on. I didn’t bring my American Bible. You wouldn’t happen to have a Bible around here, would you? One that reads in God’s native tongue, En-Ga-Lish? Of course you do. Caucasians. Living in remote Wisconsin. Farm animals. I get it. Okay, on with the show. Now, where did I put my notes? Got these off WikiHow. Okay, “if you have the power of the Spirit of God Living in you, and you know his Word, you’re ready to proceed.” We’re ready to proceed. “Step 1 – Know the symptoms. Priests are instructed to carefully determine that the nature of the affliction is not actually a psychological or physical illness before proceeding.” Got it, are you now or have you ever been crazy, nuts or otherwise bonkers? Sorry, it’s a little confusing. Can we just strap her to the bed or something so we can tell which one is possessed? No offense but they both look pretty hideous and it’s very confusing. Whichever one you want exorcised tie to the bed and let’s get this rocket lit. Chop chop. Sorry, have you seen my bag? The little black one. It has all my stuff. That’s it. I think I’m going to need some of this. Let’s see, things I will need: One Bible. Check. Holy water, check. Rosary beads, pretty sure that’s what those are, so, check. A crucifix or cross. Never leave home without it, check. Now what in the world is a “scapular?” You ever see anything like this before? Oh, you have? A what? Oh, the cloak thing that goes over the shoulders. I should be wearing that. Got it. Of course I know what I’m doing. 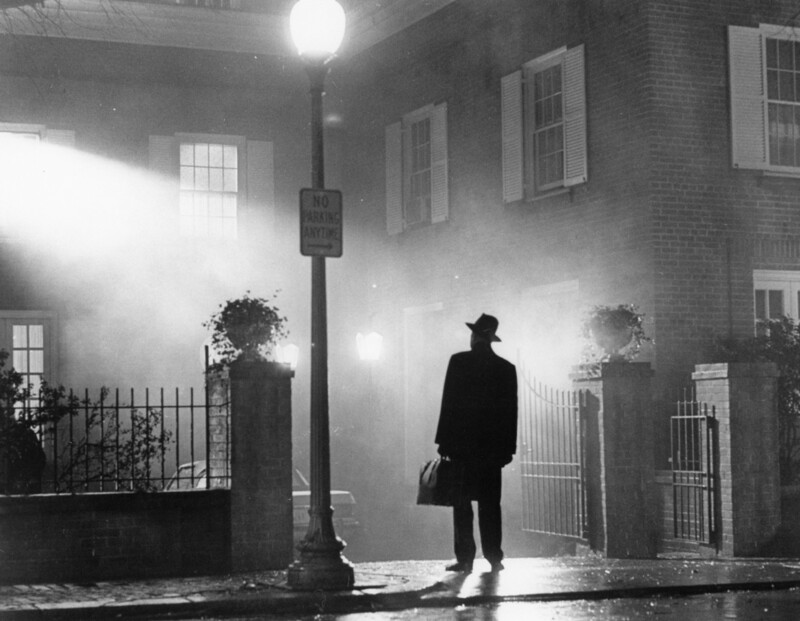 I’ve totally seen The Exorcist like a hundred times. “Fear Him, who in Isaac was offered in sacrifice,” blah, blah, blah… Then I make the three signs of the cross traced on the brow of the possessed person. This is where the holy water comes in handy. “Begone, then, in the name of the Father, and of the Son, and of the Holy Spirit.” Would you mind not doing that?You’re making me nervous. “Give place to the Holy Spirit by this sign of the holy cross of our Lord Jesus Christ, who lives and reigns with the Father and the Holy Spirit, God, forever and ever.” And then I drop the mic and walk off. Look at that. She’s looking better already. You’d never have known it was my first exorcism. This entry was posted on October 20, 2014 by Eclectic Voices in Monologues and tagged demon, exorcist, funny scary, ghost, Halloween, mark bate, monologue.